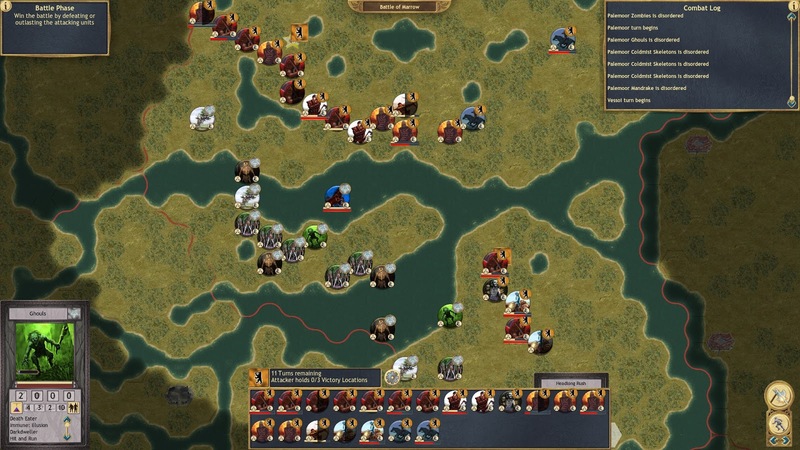 Sovereignty: Crown of Kings, published by Slitherine and developed by The Lordz Game Studio, is an interesting new take on the grand strategy genre. If a fantasy version of Europa Universalis with hex-and-counter tactical combat sounds like something you might enjoy, come see what this title has to offer. Sovereignty is a fascinating mix of ideas that I have not seen put together quite this way in any other game out there. The game takes place in a well developed fantasy world where 35(!) unique realms are available for the player to choose from. You take the lead of one of these realms and attempt to achieve a specific set of objectives. Your options as leader include engaging in diplomacy, managing the economy, developing spells, and of course building armies and taking them to the battlefield. I'll explore all of these in detail separately later. 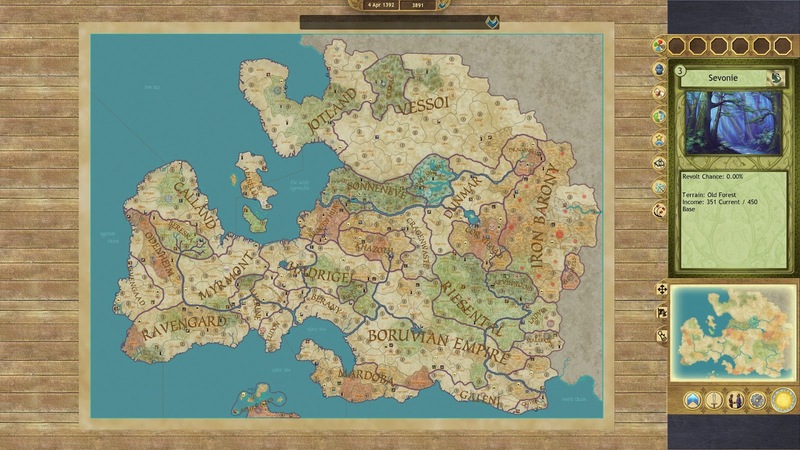 Sovereignty takes place in a detailed and complex fantasy world. The first thing you will realize when trying to decide on a realm to play is that each one has a fairly detailed back story, and that many of them are interlinked. By reading these different backstories you can get a feel for the world. There are two major human empires rivaling for power in the south, orc realms threatening on the borders, and various flavors of elves that are separated at the start, but can seek reunification. There are also human barbarian tribes in the north, a colony of pirates in the south, and swamp full of undead in the middle. There is certainly something for everyone, and every realm has a different set of goals to pursue. I found these unique goals to be one of the game's most interesting features. Unlike the open ended gameplay of most other 4X titles, here you begin each campaign with a specific set of objectives to achieve. For example, in my first (disastrous) campaign I played the High Elves of Sonneneve. Their goal is to form a powerful alliance with the other two elven realms, the Wood Elves and Dark Elves. These other elven realms are a fair distance away, have different alignments (realms can be good, evil, or neutral) and if either one is destroyed, you lose. So right out of the gate, I can see that diplomacy will be important for this campaign, as well as having a military force capable of getting me closer to those realms and aiding them in inevitable conflict. If you go play as those other elven realms, your objectives will be similar but distinctly different in one case, and completely different in the other. Some of the especially unique victory conditions include searching for clues to a hidden treasure (the aforementioned pirate realm), capturing a bunch of prisoners (the ice realm of the Winter Witch), and taking complete control of the seas (an England-like island realm). There are trade focused campaigns, campaigns focused on specific political rivalries, and of course several that require simple conquest of particular provinces. You can also choose to play each realm with more generic objectives like conquering the entire world, or taking out a particular rival. For my second, much more successful, campaign, I decided to be the Germanic barbarian themed Vessoi realm. Now my goal was to control the four "totems" so I could call the Horde to sweep across the land. I also had to ally with two of my northern neighbors. The twist here is that in order to control all of the totems, I would have to attack and conquer land from one of those neighbors, and use diplomacy to cozy up to the other, which was led by the isolationist and kinda spooky Winter Witch. Once you have settled on a realm to play, the game begins. Gameplay is split between the strategic layer and the tactical combat layer, both being turn based. You spend your time between battles on the strategic layer, purchasing units and buildings, making trades, and moving armies around. When one of your armies encounters an enemy army, the combat takes place on a more detailed map using a hex-grid. My soldiers form a line and await the undead hordes. First, let's talk about the strategic layer. In a world where Europa Universalis IV exists, any game that occupies the same niche is going up against some serious competition. I don't think there is any game development studio out there that is going to top the sort of excessive options and extreme detail found in a Paradox grand strategy game, so I won't fault Sovereignty for coming up short in a direct comparison. It's not that Sovereignty does a bad job of giving you information and options for how to shape your realm, but, overall, it can't help but feel a bit crude in the shadow of Europa Universalis IV. For example, every other realm has a relationship with you ranging from friend to enemy, but why the rating is what it is, and what variables are influencing it, is not readily apparent, compared with EU where you get a detailed breakdown of your relations and how they are changing over time. Diplomacy and trade in Sovereignty is handled in a manner that will immediately be familiar to any experienced 4X gamer. Deals can be made for resources, gold, treaties, and so on. What makes Sovereignty a bit different is that you are limited by how many "agents" you have available for assignment. Several turns are required to complete trades with realms that are further away, and your agent cannot be used for anything else in that time. Some nations have several agents available and can constantly be wheeling and dealing, while others may have only a single agent to work with. In that case, you must try to make every exchange count, since these agents are also needed for spying and influencing diplomatic relations. I was pleased to find that the AI in Sovereignty was actually willing to make fair deals with me. Too often in other 4X games I don't even bother with negotiations, since the AI usually wants an arm and a leg for even the least valuable resources. Here you can usually expect to make a deal that is both reasonable and beneficial. There are about a dozen or more resources like iron, gems, and beer to be found in Sovereignty, and acquiring access to them through trade or conquest is a critical part of the game. Any non-basic unit, and almost all province upgrades, require one or two of these resources to build. The resources are produced by specific provinces scattered across the map, which generate one unit of that resource per turn. This means that the amount of a given resource in the game world at any time is finite, making them quite valuable. At the start of the game you will often only have direct access to a couple of the resources, and will need to acquire the others somehow. There are a few ways to do this. Negotiating for a couple units of iron is simple, but inefficient, since you will immediately use them up and need more. Going to war with a neighbor in order to conquer their resource producing provinces could be a lengthy and costly endeavor, but will get you unlimited access to that resource. The third option is something that should have been a great feature in the game, but currently feels incomplete: the stock market. The market lets you sell resources for cash, or buy resources that other realms have sold. The price of the resources is supposed to depend on supply and demand. Unfortunately, the market didn't seem to work quite like it should in theory. All prices are exactly the same at the start of the game, and in my experience playing they never budged one way or the other. On most of your turns there will only be one resource available to purchase, if any. This should be a lively and interesting part of the game, but in the current iteration it is not. Besides specific resources, the most important part of your realm's economy is gold. You begin the game with a healthy income, and your primary expenses will be buying new units and paying maintenance on existing ones. There is little reason to stockpile cash on hand, so you will always want to keep your income-expense ratio pretty tight by building the biggest and best army you can afford. You can invest in upgrades to provinces to make them produce more, so you will want to keep that in mind while setting your budget as well. The more income you have, the bigger an army you can field. Another important money sink is the magic system. Every realm has a set of spells available to them, but these spells must be earned over time by gathering research points. The points can be generated by specific provinces and buildings, and can be purchased each turn in exchange for gold, with the cost per point being different for each realm. Once you have enough points, you can either unlock a new spell, or open up a new tier of spells. This is the closest the game has to a tech tree, and while the options are somewhat limited, the spells available are quite useful. Some give you a strategic layer bonus of some sort, while others can upgrade a specific unit. Higher tier spells can make powerful, and sometimes permanent, changes to provinces and units. I really enjoyed this system, since every realm had a unique array of spells available, and there was always something useful to work towards. The final way to spend your funds is the most fun, building an army. While diplomacy and trade are features of the game, make no mistake, you will need to have a large army in the field at almost all times. Units are broken down into six categories: infantry, irregulars, archers, cavalry, siege units, and naval units. Within each category you will have usually have two or three choices. The exceptions being naval units, which are not available at all to some realms, and siege units which usually have fewer options when available. The unit production screen. This dwarven realm has a lot of infantry options, but no cavalry. Now, you might be thinking that only a couple of options for infantry and cavalry sounds limited, but this is another area where the game offers a ton of variety between its 35 realms. While some units in different realms may share the same art, they all have unique names and stats. In addition to their stats, many units have attributes which further shape their role on the battlefield. Some can move across difficult terrain types with ease, others can resist cavalry charges, some strike fear into enemy units, while others can offer a morale boost to the entire army, or give you a scouting bonus on the strategic map. There are a ton of different attributes in the game, and individual units can even gain more as they survive battles and level up. The armies of most realms have some kind of theme, and these attributes go along with it. The better units require specific resources, as mentioned previously. At the start of the game you have access to all of your possible units, but not the resources needed to build them. One thing that disappointed me about the units was that they have no accompanying description or flavor text. There is a box for it on the unit purchase screen, but for every unit it is either blank or contains a quote from a real world historical figure like Sun-Tzu or Otto von Bismark. It's a bit odd that these descriptions are absent, since there was clearly a lot of effort put into giving each army a distinct style and interesting units. A user mod on the Steam Workshop is available to rectify this, but I would prefer official descriptions. In addition to regular units, you can recruit heroes to lead your forces. These heroes do not appear in the battle, but instead give you one-shot abilities that can be used to turn the tide in your favor. As your heroes lead battles, they can level up, at which point you get to choose a new ability for their arsenal. There is a lot of variety in these abilities. Since you can only use each one once per battle, you will want to time it carefully to maximize the effect. This adds an interesting wrinkle or two to each fight, and makes your individual armies feel more distinct, even if they contain the same list of units. That covers all of the elements of the strategic layer, so let's take a look at what happens when two armies collide. You are first given the option to fight it out manually or auto-resolve. I really liked the auto-resolve feature in Sovereignty compared to games like Total War. Instead of simply clicking and getting a result, here the auto-resolve is broken into three phases, offering you multiple chances to retreat or press the fight. There is also more suspense, as you watch the unit icons smack each other around one at a time until one side retreats or is annihilated. In most cases though, the best result will be gained by taking direct control of your forces. This option takes you to the tactical battlefield, where all the abilities discussed before come into play as you maneuver units around a hex-based grid depicting the local province. This phase of the game handles much like Panzer General and similar titles, so will be easy to jump into for most strategy gamers. I found this portion of the game to be surprisingly good. It offers a light wargame feel where the unique attributes of your various units really shine. Terrain plays a major role in the battles, and the home team will often have some kind of advantage in this regard. Attacking across a river can be especially tricky. Common sense tactics, like forming a solid line of infantry backed by archers, will give your forces the edge. Cavalry must have flat ground and open attack lanes to fully maximize their charges, which are more powerful the further away they start from the target. Archers can deal a lot of damage at range, but are helpless if melee units reach them. You will want to keep units alive, since they can level up and gain better stats or special abilities. These experienced units can make short work of freshly recruited foes later in the game. While the early game battles feature mostly standard units slugging it out, the fighting only get more interesting as more exotic options become available. You are limited to four each of your "elite" units, and they can take many turns to build, but once you get them on the field they really light things up. In my Vessoi campaign I was always excited to get my Shapeshifters (think werewolves) into the action, where they made mince meat of most foes. Other higher tier units include dragons, unicorns, walking trees, undead nightmare creatures, and all sorts of other fantasy genre highlights. The primary downside here is that the AI is not the best. Every battle involves the attacker trying to occupy two or three cities while the defender holds them off for X turns. A human player can often trick the AI into maneuvering its forces poorly, and either seizing the objectives when attacking or distracting the AI long enough to run out the clock when defending. This assuming your forces aren't strong enough to simply crush the AI army in direct battle. That isn't to say I won every battle against the AI, because I certainly got my rear end handed to me a few times. So, between all of these interesting pieces, how does the whole stack up? For me, the game somewhat remains a diamond in the rough, even after almost two years in early access. There are a lot of things here I really like, and I love the concept of the game. However, it still feels not quite finished in some ways, as I mentioned earlier. There are reports of bugs from other players, and I experienced a few myself. I also found that the UI was at times clunky, with one open window covering another, or not displaying the information I expected it to display as I moused over various parts of the screen. Despite those issues, I do really like what The Lordz Game Studio is doing here. The game is a one of a kind experience, letting you jump into something like a basic version of Europa Universalis set in a fantasy world of dwarves and orcs and elves. Unlike EU, here you get to take direct control of your forces in battle and lead them to victory or defeat, instead of watching some numbers tick as the invisible dice roll. While there are other fantasy 4X's out there, none offer such a detailed and ready made world to explore. The world of Sovereignty feels like it has history, and the events that unfold during the game add to that story. Every time I started a new campaign I was confronted with a very different set of circumstances, and few games can make that claim. Fewer still can do so while offering thirty-five different choices of nations to lead. Considering the game's very reasonable price of $25, I think anyone interested in a strategy game with a fresh take on things should give it a shot. With a touch more polish and elbow grease, this game could rise above it's current shortcomings and become a great game that stands alone in style and substance. Sovereignty: Crown of Kings is available directly from Matrix Games/Slitherine, and on Steam.